Big Solutions for Small Businesses. As a small business, Reveal understands how to adapt our large, corporate recruiting experience to eliminate the frustration, fear of “getting it wrong," and consumption of time expressed by most leaders of smaller companies. Whether the hiring need is due to growth, attrition, or top-grading, we’ve got you covered. We adapt and scale the processes and solutions we developed in large corporations to fit the needs of our small-to-midsize client companies. Enough already with the mediocre results and excessive fees coming from traditional search firms and post-and-pray efforts. Since 79% of the working population won’t see a job posting, let us Reveal that portion of prospective candidates to you. From finance to pharmaceuticals; entertainment to aerospace—our clients range across multiple industries, functions and over 40 countries. Here's how we help Small-to-Midsize Businesses find their next hire. Find the perfect addition to your team. Not only do we ensure you get quality hires, we also help you build your business to be more self-sufficient in the long run. Not too long ago, LinkedIn celebrated its 500-millionth member. People are more discoverable than they ever have been in the past. This creates a challenge for recruiters because passive candidates are now becoming more and more inundated with calls from recruiters. This challenge calls for a new approach. Purpose-Driven Recruitment™ models acknowledges this trend and deals with it. 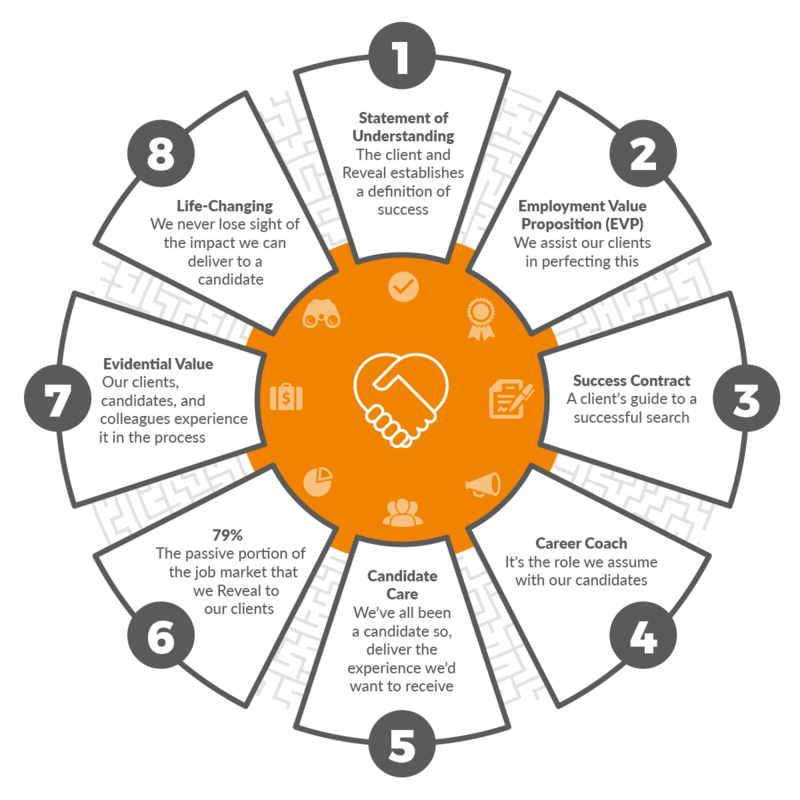 Our methodology does not focus on “pitching the job” more effectively than the next recruiter. Rather, we assume a career-coaching role and help passive candidates understand what is most important to them. Recruitment Consulting & Training is organized around our Purpose-Driven Recruitment model and CORE curriculum (Center of Recruitment Excellence). The emphasis here is on passive (hidden and apprehensive) talent. A new Purpose-Driven Recruitment consultant who joins Reveal experiences 168.5 hours of training and on-boarding—the full curriculum. We’d be happy to explore the portions of this content that align to your needs.